A good reproduction Regency style open armchair with a cane seat. 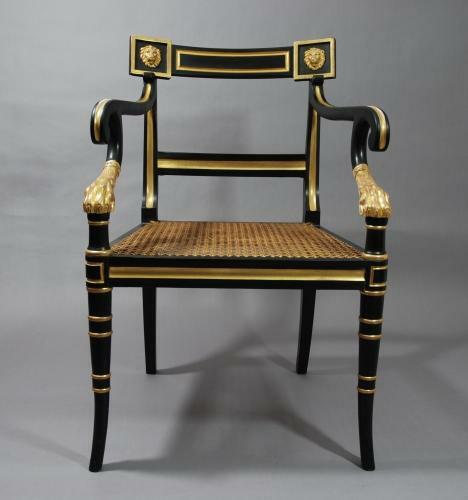 This chair is made of beech & has been ebonised & gilded. This chair is of sound construction & condition. The top back support consists of three panels: the outer square panels have a carved lion mask decoration in each. The central panel has a carved rectangular design. There is a single splat support underneath this. The arms are a scroll shape & the arm supports lead down to a hairy paw foot design. The cane seat is in good condition & could have a cushion made if the purchaser so wished. The front legs are turned & the back the legs are splayed. This chair was possibly produced by a local company, Ratcliffe & Son who made very similar items.